United Nations Secretary-General Antonio Guterres condemned a gruesome attack Thursday in northwestern Yemen that killed at least 50 people, most of them children. 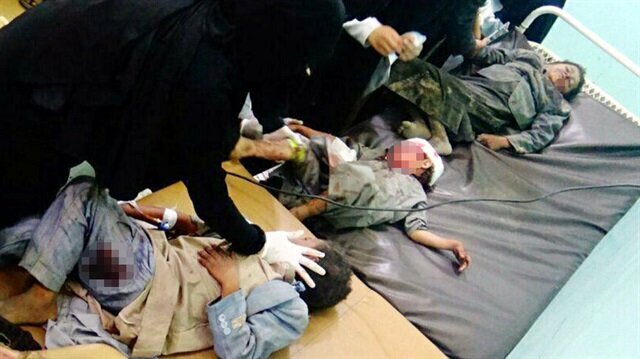 Seventy-seven others were injured when a bus carrying children came under attack in Saada province, according to the International Committee of the Red Cross (ICRC). A statement on behalf of Guterres said local health authorities confirmed the casualties, the majority of them children between 10 and 13 years old. "He [Guterres] expresses his deepest condolences to the families of the victims," said the statement. The UN chief called on "all parties to respect their obligations under international humanitarian law", saying they must take constant care to spare civilians and civilian objects in military operations. He also called for an independent and prompt investigation into the incident. The only way to end the Yemen conflict, said Guterres, is "a negotiated political settlement through inclusive intra-Yemeni dialogue". He urged all parties to de-escalate and to engage constructively in the political process. Yemen has remained wracked by violence since 2014, when Shia Houthi rebels overran much of the country, including the capital, Sanaa. In a statement, a Houthi spokesperson blamed the Saudi-led coalition for the attack. The coalition has yet to comment on the incident. Air strikes killed dozens of people, including children, in Yemen's Saada, Yemeni medical sources and the International Committee of the Red Cross (ICRC) said on Thursday. "Scores killed, even more injured, most under the age of 10," Johannes Bruwer, head of delegation for the ICRC in Yemen, said in a twitter post.Saudi Arabia and Sunni Muslim allies have been fighting in Yemen for more than three years against the Iran-aligned Houthis, who control much of north Yemen including the capital Sanaa and drove a Saudi-backed government into exile in 2014.There was no immediate comment from the Saudi-led coalition. The goal of U.S. economic sanctions against Iran is a great threat for the country. In the first phase, the U.S. wants to lead Iran into a state of introversion and for it to retreat from regions such as Syria, Lebanon, Iraq, Palestine and Yemen.If the sanctions are long-term it could jeopardize Iran policies. The most serious threat is triggering an atmosphere of chaos, which would lead to a division of the country by causing financial difficulties and increasing unemployment rates.The sanctions target Tehran's acquisition of U.S. dollars, the trade of precious metals, transactions related to Iran's rial, activities relating to Iran's sovereign debt, and the country's automotive sector.Stating that the Trump administration was using Iran as domestic political leverage ahead of November's midterm elections in the states, Iranian President Hassan Rouhani said, "They want to launch psychological warfare against the Iranian nation.Iran links talks with US to lifting of sanctionsThe first round of the U.S. sanctions were re-imposed early Tuesday under an executive order, and President Donald Trump, who defied Washington’s allies, pledged that companies doing business with Tehran would be barred from doing business with the United States.Iran dismissed a last-minute offer from the Trump administration for talks, saying it could not negotiate while Washington had reneged on a 2015 deal to lift sanctions in return for curbs on Iran’s nuclear program.Iran FM slams US sanctionsIn May, Trump withdrew the U.S. from a nuclear deal, which was signed in 2015 between Iran and the P5+1 group of nations (the five permanent members of the UN Security Council plus Germany).The nuclear deal places restrictions on Iran’s nuclear program in exchange for billions of dollars in sanctions relief.US will not be able to prevent Iran from exporting oil: Iranian FMSanctions could lead the region to chaosThis unpredictable attempt is being evaluated as the beginning of a process that needs to be followed carefully. It is emphasized that Iran should take measures to protect its integrity and deliver calming and uniting messages to its nation and neighbors, because the region cannot overcome another war after those in Syria and Iraq.On the other hand, the PKK-linked and U.S.-backed the Kurdistan Free Life Party (PJAK) terror organization is another threat Iran may have to deal with, as terrorists could take this chaos as an opportunity to ramp up their attacks.